Some plants might be dormant during winter shipping. JASMINE: A jasmine plant is a great addition to a garden or a home. Jasmine, known for its beautiful flowers and shining leaves, can fill your house with a unique fragrance. Jasmine is basically a bushy shrub that releases fragrance at night. There are 200 species, mostly from Asia, Europe and Africa. Jasmine is native to tropical and warm temperate regions. 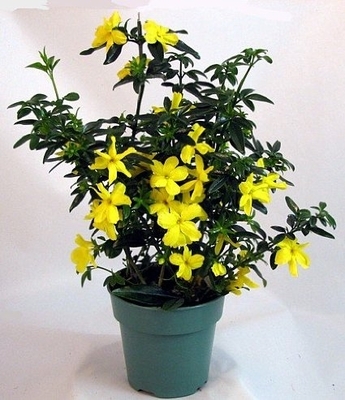 The Primrose Jasmine (Jasminum mesnyi) is native to southwestern China. It blooms heavily in late winter into spring. The rest of the year it blooms sporadically. Native to zones 8-11, the Primrose Jasmine makes an excellent houseplant. Grow in a sunny or part-sun window and keep evenly moist, but not wet or dry. Never allow the plant to stand in water. It does not like "wet feet." Fertilize monthly with an acid, soluble plant food (Miracid). Trim as needed. An added plus for this plant, the flowers are edible! The plant you will receive is growing in a 4" pot as pictured. There are multiple, well branched plants in the pot. It will be budded, ready to bloom, but we cannot guarantee it will be in full bloom when you receive it.